Cities around the U.S. are grappling with controversies related to public art, historical monuments, and other memorials. The panelists for this event bring extensive experience from a variety of cities to this topic. Join textile and social practice artist Sonya Clark in a public conversation with Artistic Director/Host Paul Farber for a live recording of the Monument Lab Podcast. Together, they will explore Clark's research informing her upcoming exhibition at The Fabric Workshop and Museum in Philadelphia, Monumental Cloth, The Flag We Should Know, on view March 29 – August 4, 2019. In presenting this exhibition, Clark questions: "Why do we know the Confederate Battle Flag instead of the Confederate Truce Flag that marked surrender, brokered peace, and was a promise of reconciliation? What would it mean to the psychology of this nation if the Truce Flag replaced the flag associated with hate and white supremacy?" Clark investigates the legacy of symbols and challenges the power of propaganda, erasures, and omissions. By making the Truce Flag into a monumental alternative to the infamous Confederate Battle Flag and its pervasive divisiveness, the exhibition instigates a role reversal and aims to correct a historical imbalance. FWM is housed in a former flag factory, a particularly fitting place to ask questions about the symbolic power cloth can hold in the consciousness of our nation. Monumental Cloth, The Flag We Should Know is a timely catalyst for dialogue about the scars of the Confederacy and America's ability to acknowledge and reckon with racial injustice. The first fifty people to arrive will receive a keepsake from FWM as a memento of this event. Image credit: Sonya Clark, in collaboration with The Fabric Workshop and Museum, Philadelphia. Woven replica of the Confederate Flag of Truce,2019. Photo credit: Carlos Avendaño. Looking for solutions to the dilemma of how to confront and constructively dress difficult places of memory or their absence? This panel and discussion will offer physical and virtual alternatives that use a variety of media to promote public dialogue about how and what we remember. Monument Lab is a public art and history project based in Philadelphia that comprises a team of curators, artists, scholars and students. Over the last several years, Monument Lab has organized several major public art interventions that asked: What is an appropriate monument for the current city of Philadelphia? The prompt fueled a citywide exhibition in 2017 presented with Mural Arts Philadelphia, featuring the installation of 20 prototype monuments in public squares and neighborhood parks, joined by learning labs staffed by youth research teams. Out of this exhibition, we just released our Report to the City, a reflection on nearly 4,500 public monument proposals gathered at the labs with insights into how public participants imagined new monuments. The key priorities reflected in the proposals: Rethinking common knowledge, craving representation, seeking connection with others, and reflecting on process and power. Hear more about this project and next steps from Monument Lab curators Paul Farber and Ken Lum and Mural Arts Program's Jane Golden. Monument Lab is a national public art and history project based in Philadelphia that comprises a team of curators, artists, scholars and students. In 2017, Monument Lab teamed with ten municipal agencies including Mural Arts Philadelphia to produce a citywide exhibition organized around a central question: What is an appropriate monument for the current city of Philadelphia? This line of inquiry was aimed at building civic dialogue about place and history as forces for a deeper questioning of what it means to be Philadelphian in a time of renewal and continuing struggle. Over 250,000 people engaged with the exhibition across the city, which featured prototype twenty prototype monuments installed at City Hall, iconic public squares, and neighborhood parks, as imagined by leading public artists focused on themes of social justice and solidarity. Additionally, Monument Lab opened adjacent learning labs at these sites which were operated by teams consisting of local educators, high school fellows, and college students enrolled in a Civic Studio course. Through their efforts, 4,500 speculative public monument proposals were gathered from participants. As an outcome to this exhibition, the research team produced a Report to the City presented to the Mayor and all the city commissioners, shared the proposals as open data set of all of the proposals on OpenDataPhilly, and extend learnings with continued collaborative installations and projects in cities aimed at unearthing the next generation of monuments. Artistic Director and Co-Founder Paul M. Farber shares insights, reflections, and next steps for Monument Lab. This session, which will involve a short presentation followed by discussion, will examine the role of monuments and memorials in telling the full history of the American past. While the discussion surrounding Confederate memorials is important, this session will seek to address monuments and memorials more broadly by examining the challenges to memorializing individuals from underrepresented communities, engaging with examples of memorials and monuments used to change the game, and exploring the role of preservationists in supporting such projects in their communities. Monument Lab is a public art and history initiative based in Philadelphia that comprises a team of curators, artists, scholars and students. In 2017, Monument Lab teamed with Mural Arts Philadelphia to produce a citywide exhibition organized around a central question: What is an appropriate monument for the current city of Philadelphia? This line of inquiry was aimed at building civic dialogue about place and history as forces for a deeper questioning of what it means to be Philadelphian in a time of renewal and continuing struggle. Hear from lead curators and artists on creating an engagement strategy that resulted in twenty "prototype" monuments in public spaces, registered over 200,000 in-person engagements, and collected close to 4,500 creative monument proposals from Philadelphians and visitors. Artist Michelle Angela Ortiz will also present her Monument Lab project, Seguimos Caminando (We Keep Walking). The MAS Summit for New York City, now in its 9th year, is a signature conference that attracts a diverse audience of policy-makers, industry leaders, and engaged citizens. Through a series of panel discussions, keynote lectures, presentations, and performances, the Summit connects participants in a daylong dialogue about the most important issues affecting New York and other global urban centers. The 2018 Summit will explore present-day concerns about the issues central to our long history of advocacy. From preserving the character of rapidly changing neighborhoods to examining the future of our public realm in the age of the autonomous vehicle, this year’s Summit tackles the most prominent issues shaping the city. At the center of this discourse is the critical role that the individual plays in the process. Funding for the 2017 Exhibition: Lead Monument Lab partners included the City of Philadelphia; Philadelphia Parks & Recreation; Office of Arts, Culture, and the Creative Economy; Historic Philadelphia; Independence National Historic Park; Penn Institute for Urban Research; Pennsylvania Academy of the Fine Arts; Price Lab for Digital Humanities; and the University of Pennsylvania. A panel on Public Art will bring scholars, artists, curators together to discuss what public art can do, or should do in the urban environment. Cleveland is a city with a spacious built environment that has recently seen great renovation to public areas along the lakefront and city center. Art has and surely will continue to attract interest for in reshaping the urban core. How does the biennial model fit into this? What is the role of the temporary or permanent? Must public art be monumental to be effective? Panelists will include curators of nationally recognized city public art programs, each with specific models and goals. In addition, Michelle Grabner, FRONT Artistic Director, and FRONT artists Virginia Overton and John Riepenhoff will join to represent diverse approaches to the topic of making art in and for the public. Contributors include two FRONT artists whose work integrates with the urban fabric in different ways and expresses diverse attitudes about the nature of artmaking and cultural practice today. Invited curators of public art programs offer two models; one, the Highline, in which art and programming is tied to specific tract of land. The other, Monument Lab, operates throughout the city of Philadelphia, creating projects with rotating teams of artists, students and curators that stretch the definition of monument beyond physical structures into knowledge-based monuments and shared experiences. Image: Virginia Overton, Untitled(Black Diamond), 2018. Installation view at University Hospital, FRONT International: Cleveland Triennial for Contemporary Art. July 14-September 30, 2018. Courtesy of the artist and Bortolami, New York. Photography by Field Studio. As we experience this moment of intensity and uncertainty around public monuments—especially those that symbolize the enduring legacies of racial injustice and social inequality—we are reminded that we must find new, critical ways to reflect on the monuments we have inherited and imagine future monuments we have yet to build. This discussion about monuments will expand on the conversation coordinated by Mural Arts Philadelphia and Monument Lab. Image: Monument to New Immigrants, Tania Bruguera. Photo: Maria Moller. Taking civic dialogue and imagination as forces for social change, Philadelphia’s Monument Lab asks the question: What is an appropriate monument for our city? Monument Lab, along with Colby faculty and students, will facilitate a community conversation on the role of public art. This event is part of the “Space for Conversation” series: discussions about public art cohosted with Waterville Creates! Studies of landscape are at the center of the intersecting fields of fine arts, environmental research, and historical inquiry. Christopher Tilley defines"landscape" as "a holistic term" that frames relationships between living beings and locales, "forming both the medium for, and outcome of, movement and memory." For interdisciplinary arts practitioners in Philadelphia, the landscape is far from a static site, as it conjures such relationships at points of convergence: when the physical and symbolic layers of the city lay bare social dynamics, truths, and opportunities for action. Such a range of landmarks - including monuments, rivers, gardens, public parks, rowhomes, statues, municipal infrastructure, waste streams, the skyline - are indicative of the deep histories of the region itself, as well as the human-activity that traffics upon it. To produce work about and from Philadelphia is to inherit long-standing questions of civic belonging, make sense of shifting demographic and ecological conditions, and to balance aims for striving and coexistence. Paul M. Farber, Artistic Director of Monument Lab and Managing Director of the Penn Program in the Environmental Humanities, reflects on landmarks of convergence, and methods and projects that experiment with and seek ideation through public engagement, environmental and civic advocacy, and historical reckoning. Response by Pedro Lasch, Director, Social Practice Lab. What is an appropriate monument for the current city of Philadelphia? To reflect on this line of inquiry, Monument Lab – a research team led by Ken Lum and Paul Farber, with collaborators in the School of Arts and Sciences, PennDesign, Penn Libraries, Penn Institute for Urban Research, Price Lab for Digital Humanities, and dozens of other municipal partners across the city – staged a two-month citywide public art and history exhibition with Mural Arts Philadelphia last Fall. Over 200,000 people engaged with the exhibition across the city, which featured prototype monuments at City Hall, iconic public squares, and neighborhood parks, as imagined by leading public artists focused on themes of social justice and solidarity. Additionally, Monument Lab opened adjacent learning labs at these sites which were operated by teams consisting of local educators, high school fellows, and Penn students enrolled in a Netter Center-supported class "Civic Studio course." Through their efforts, close to 5,000 speculative public monument proposals were gathered from participants. As an outcome to this exhibition, the research team will produce a forthcoming Report to the City, share an open data set of all of the proposals on OpenDataPhilly, and extend learnings with continued collaborative installations and projects in cities aimed at unearthing the next generation of monuments. Philadelphia is a city full of monuments and memorials. Philadelphia is also a city full of monumental histories, many of which are little known, obscured, or simply unacknowledged. These underrepresented histories often exist in tension with officially acknowledged narratives. As a society, through this moment of intensity and uncertainty around public monuments—especially those that symbolize the enduring legacies of racial injustice and social inequality—we are reminded that we must find new, critical ways to reflect on the monuments we have inherited and imagine future monuments we have yet to build. For the Teach-In, Monument Lab collaborators will present research projects from Penn students in the Civic Studio course, including final projects that offers guidance on the creative and civic impulses of monument making; a first glimpse at the public proposals and data sets collected by students at the labs across the city; a takeaway self-guided tour of the Schuylkill River-as-Monument; and a special virtual reality tour of the exhibition's prototype monuments produced by Penn Libraries’ PennImmersive. The exhibition will be hosted in the Charles Addams Fine Arts Gallery, and will be open 10:00am-5:00pm each day of the teach-in, with an opening reception on Tuesday, March 20th from 4PM-6PM. What is an appropriate monument for a current American city? To reflect on this line of inquiry, Monument Lab – a team of scholars, artists, students, and researchers – staged a two-month citywide exhibition in Philadelphia this fall. 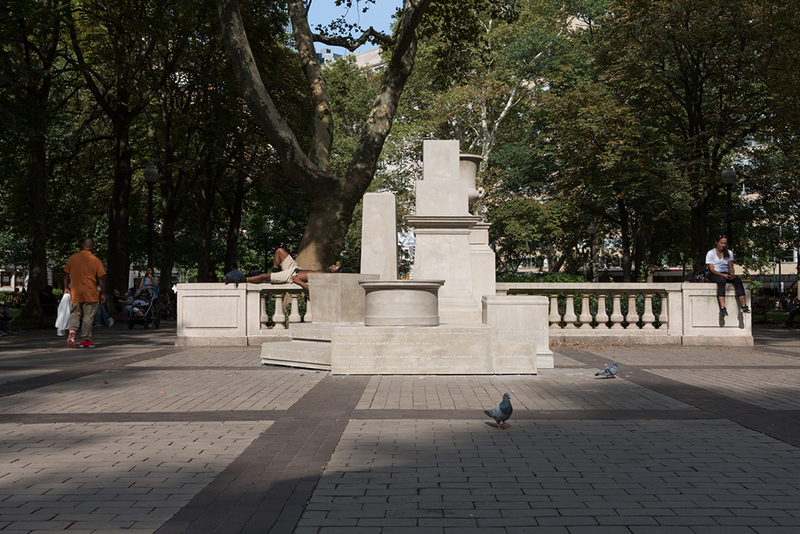 Situated in the midst of a massive public reckoning with monuments sweeping the U.S., the exhibition included prototype monuments by twenty artists including Mel Chin, Tania Bruguera, and Hank Willis Thomas, whose works dealt with issues of social justice and solidarity; in addition, Monument Lab's research team opened ten adjacent learning labs in public squares and neighborhood parks throughout the city, operated by teams of high school and college students who gathered thousands of speculative public proposals from participants. The end result includes a Report to the City, an open data set, and continued collaborative installations and projects. Paul M. Farber, Monument Lab Artistic Director and Co-Founder, will discuss the outcomes of this stage of the project – and reflect on next steps for this project's artistic, environmental, and civic aims. On Sunday, November 19th and Sunday, December 3rd from 1PM-5PM, the Monument Lab Curatorial Team will host a set of research debrief working sessions and closing office hours. The lab staff and data team will discuss initial research highlights, and invite visitors to ask questions about their preliminary findings. Lab staff will reflect upon their experiences working in the field while collecting monument proposals and engaging with the public, as the data team begins to transition toward a deeper process of transcription and analyses. Starting September 24, Emeka Ogboh featuring Ursula Rucker's Logan Squared sound installation will be on view on Sundays from 2–4:30 p.m. at the Free Library of Philadelphia’s Parkway Central location. Part of the citywide Monument Lab exhibition, Logan Squared is a sound monument to public voice and collective memory. Ogboh’s work incorporates Rucker's poetry and choral music, braiding sounds together for an immersive experience. FREE. As a monument to Philadelphians’ voices and visions, Emeka Ogboh’s Logan Squared: Ode to Philly features a collaboration with beloved Philadelphia poet Ursula Rucker, members of the Chestnut Street Singers, and hundreds of Philadelphians whose ideas were documented during Monument Lab’s discovery phase. Throughout his work, Ogboh creates soundscapes to honor and understand cities. For Monument Lab, Ogboh conceived of a collaboration to channel public participation and reflection. Responding to the Monument Lab open dataset, Rucker composed an epic poem serving as the backbone of this composition. Visitors may access the sound monument at listening stations around the square where they can plug in their headphones to access the composition, or attend a special weekly multichannel sound installation on the Skyline Terrace of the Parkway Central Library. In the rooftop version, attendees are invited to experience a multichannel sound installation, including the sounds of Rucker’s poem and a special choral arrangement of Louis Gesensway’s Four Squares of Philadelphia: “Logan Square at Dusk,” as well a singular view of Logan Square. Philadelphia’s most monumental project of 2017 concludes with a keynote conversation between Michael Eric Dyson (professor and author of Tears We Cannot Stop), New York Times architecture critic Michael Kimmelman, and scholar/activist/social critic Salamishah Tillet (faculty member at University of Pennsylvania), moderated by Monument Lab co-curator Paul M. Farber. They’ll discuss the overarching themes and questions raised by Monument Lab, as well as the future of memory in public space. $5 / Free for PAFA Members. $5 / Free for PAFA Members.Seating is limited. Registration required. Mural Arts Philadelphia’s citywide Monument Lab continues with a Saturday Spotlight event at Vernon Park, with music and food from 1–4 p.m. This event will feature Monument Lab artists Jamel Shabazz—holding portrait sessions for his project paying tribute to African American veterans—and Karyn Olivier—currently installing The Battle Is Joined, a mirrored remixing of the Battle of Germantown Memorial. FREE. A monumental project is bound to lead to monumental conversations. In this four-part event series, Monument Lab artists join forces for talks about the role of the artist in relation to monument-making, as well as thoughts on meaning, memory, representation, equity, and dialogue in public space. Artists Jamel Shabazz and Mel Chin will take part in a public conversation about the Monument Lab exhibition and their projects, moderated by Annette John-Hall, WHYY reporter for Keystone Crossroads, a statewide public media initiative focused on the problems facing Pennsylvania’s cities and possible solutions. FREE. Starting September 24, Emeka Ogboh featuring Ursula Rucker's Logan Squared sound installation will be on view on Sundays from 2–4:30 p.m. at the Free Library of Philadelphia’s Parkway Central location. Part of the citywide Monument Lab exhibition, Logan Squared is a sound monument to public voice and collective memory. Ogboh’s work incorporates Rucker's poetry and choral music, braiding sounds together for an immersive experience. . FREE. Join artist Michelle Angela Ortiz at the Monument Lab Research Field Office located on the grounds of the Barnes Foundation this Fall for a series of free paper flower workshops, in conjunction with her Seguimos Caminando (We Keep Walking) prototype monument at City Hall. Ortiz is making thousands of paper flowers, a tradition passed down by her maternal grandmother, with messages of freedom for the families detained at the Berks Detention Center, a prison outside of Philadelphia for immigrant families. The flowers created here will be assembled in a creative action at City Hall in late October. Ortiz intends to honor mothers previously or currently unjustly detained at Berks Detention Center along with partners from the Shut Down Berks Coalition. Ortiz will adorn the windows of the Field Office with the flowers to prepare them for City Hall, and then re-stage this creative action in the Barnes Foundation's light filled Annenberg Court on Sunday, November 5. Sunday, Oct.1: 1-4 p.m.; Saturday, Oct. 7: 1-4 p.m.; Saturday, Oct. 14: 1-4 p.m.; Friday, Oct. 20: 6-9:30 p.m.; Saturday, Oct. 21: 1-4 p.m.
Monday, Oct. 23: 12:30-3 p.m.; Sunday, Nov. 5: 9-11:30 a.m.
Mural Arts Philadelphia’s citywide Monument Lab continues with a Saturday Spotlight event at Washington Square, with music and food from 1–4 p.m. This event will feature Monument Lab artists Kaitlin Pomerantz and Marisa Williamson, whose projects reveal missing or lost Philadelphia stories. Pomerantz’s On the Threshold explores the city’s stoop culture, while Williamson is creating an interactive scavenger hunt app that will lead a narrative about African American history in and around Washington Square. FREE. Throughout her body of work, Michelle Angela Ortiz engages with experiences of immigration in Philadelphia, especially through family stories and intergenerational histories. For Monument Lab, Ortiz’s Seguimos Caminando (We Keep Walking) imagines the gates of City Hall as a space of imaginative projection, juxtaposed with hundreds of sculptures on the building that mark the historic and mythic past of the city. In a series of animated projections held on Wednesday and Friday evenings throughout the exhibition, Ortiz will honor mothers previously or currently unjustly detained at Berks Detention Center, a prison outside of Philadelphia for immigrant families. The animated images in her moving monument originate from compiled writings from two mothers sharing their stories while detained at Berks. Ortiz worked on Seguimos Caminando with the Shut Down Berks Coalition and the mothers detained at Berks, and will organize a creative action with Shut Down Berks during the Monument Lab exhibition.